This book critically analyses the changing role and nature of post-Cold War humanitarianism, using Foucault's theories of biopolitics and governmentality. 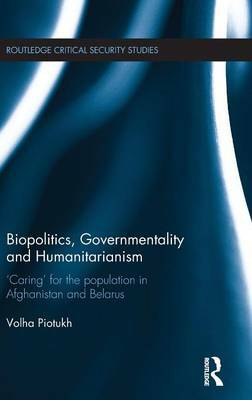 It offers a compelling and insightful interpretation of the policies and practices associated with `new humanitarianism in general, as well as of the dynamics of two specific international assistance efforts: the post-2001 conflict-related assistance effort in Afghanistan and the post-2000 Chernobyl-related assistance effort in Belarus. The central argument of the book is that `new' humanitarianism represents a dominant regime of humanitarian governing informed by globalising neoliberalism and is reliant on a complex set of biopolitical, disciplinary and sovereign technologies. It demonstrates that, while the purposes of humanitarian governing are specific to particular contexts, its promise of care is more often than not accompanied by sovereign and/or biopolitical violences. Making an important contribution to existing scholarship on humanitarian emergencies and humanitarian action, on biopolitics and governmentality, this book will be of much interest to students and scholars of humanitarianism, critical security studies, governmentality and International Relations generally.